This week Google announced a great new tool called Google Correlate which gives users correlation search data by time and region (although currently it’s only showing data from the US). It’s a bit like Google Trends or Google Insights for Search in reverse where users can enter a query and receive search trends by time and location. 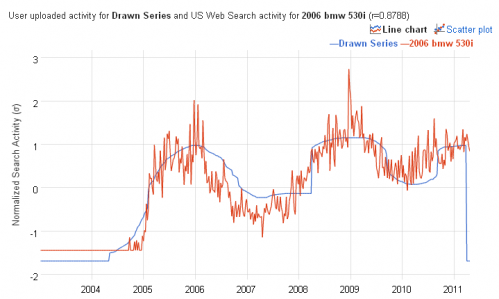 With Google Correlate, users enter data and get back a list of search queries which follow a similar pattern. Hence the name Google Correlate. Clever eh! If you’d prefer, you can even upload your own data or draw your own line chart and Google Correlate will try to publish the same correlation search data as your own. But that’s for later. 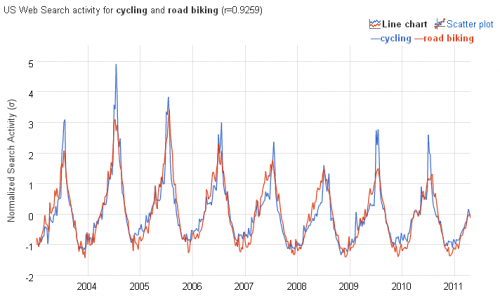 So I’m a keen cyclist and I wanted to know what correlation data existed around the search term “cycling”. 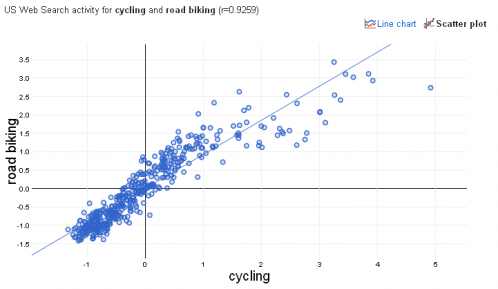 Google found the following correlations after entering “cycling”. 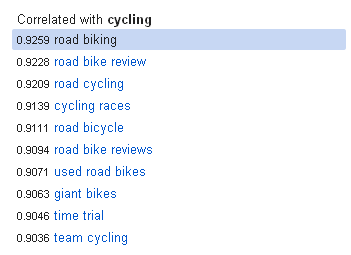 The results may not be particularly surprising in this instance as search terms like “road biking” and “road bicycle” are obvious synonyms of cycling. But nonetheless, this is useful when carrying out keyword research for your search marketing activity. And it’s one step up from the Google Keyword Tool we all know and love. Interestingly, in this instance, Google Correlate chose to correlate cycling with cycling clothing regionally, possibly due to climate differences across the US. Turning Google Correlation in reverse, you can draw your own line chart and Google Correlate will find correlation data that matches. This took some attempts on my part and eventually I came up with the following results from my drawn series.